Living with a chronic condition requires ongoing adjustment to physical, psychological and social demands. To date, patients are expected to be flexible and to take an active role in their disease management in the form of self-management. To be able to take an active role, patients must possess certain skills to solve problems, form partnership with their healthcare professionals, and take action. Give these requirements, most patients they will need support from health care professionals. Nurses are in an excellent position to play a significant role in self-management support. Still, they need to be properly equipped with new competencies, adequate training and sufficient interventions. 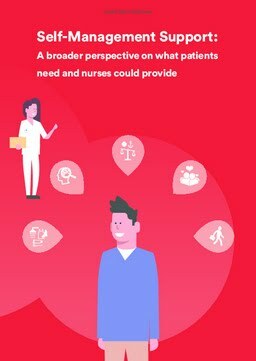 The findings from the studies in this thesis contributed to more understanding how nurses could support patients in the self-management challenges they experience in dealing with a chronic condition in daily life. These patients wish to receive self-management support that fits with their needs, does not have a limited (biomedical) focus and that addresses all daily life areas challenged by the disease. Receiving standardised education is not sufficient. From the patients’ and professionals’ points of view, the newly developed self-management intervention seems to be feasible. Regularly assessing the daily-life challenges with the Self-Management Web ((related, among other things, to work, (intimate) relationships, financial aspects, adherence to therapy)) and tailoring support accordingly had an added value for both. It helped nurses to facilitate their patients to develop the problem-solving skills needed to live a satisfactory life despite the illness. Keywords Self-management support, self-care, chronic disease, nurses, nurse practitioner, outpatient, intervention evaluation.